First employed in 1941, Oldsmobile's `98' nomenclature was reserved for the top model of the range, and continued to be so right up until the birth of the Aurora in 1996. Under the circumstances, models bearing the 98 badge can be considered to be the most technically advanced and best equipped cars available from Oldsmobile at the time of their manufacture. The 1964 98 Rocket Luxury Pillarless sedan on offer was delivered new to Miss Jean Anne Wheeler-Bowler of Ohio in 1964, who kept it until 1988 during which time she covered just 18,000 miles - a mere 750 miles per year. The car was then imported to the UK and, following three years of storage, registered to a gentleman in East Sussex who owned `DAP 304B' right up until August of last year by which time its odometer reading had increased to just 24,000 warranted miles (the current reading is 24,252). This rare vehicle is said to be in remarkably original condition and, according to the vendor, has never been damaged, repaired or even reupholstered. The spare wheel is said to be unused to this day and the original dust cover to be in the boot along with the original jack and tools - even the spare wheel instruction sticker apparently remains intact on the inside of the bootlid. The car was the subject of a seven-page article in Classic American magazine in August 1995. The piece is said to have commented, "This vehicle, this 1964 Oldsmobile 98 Luxury Sedan, must surely be one of the most pristine original cars we have seen!" It is now offered for sale together with the original certificate of title from Ohio, MOTs for the last 18 years, a copy of the Classic American feature and the numerous trophies and plaques it has won over the years. Also the original handbook, complete with the stamp of the dealer who supplied the car to Miss Wheeler-Bowler all those years ago. This splendid lefthand drive Oldsmobile is powered by a 6457cc (394 cu in) V8 motor - the largest of the first generation Rocket engines - which is mated to an automatic gearbox. The paintwork is white. The list of extras fitted to the car is said to include: centre control air conditioning; colour coded seat belts; vacuum-operated boot lid control; de-luxe pushbutton radio; safety padded dashtop and pale blue foam cushioned seats. DAP 304B would seem to be one of those wonderful time-warp machines that crop up from time to time. 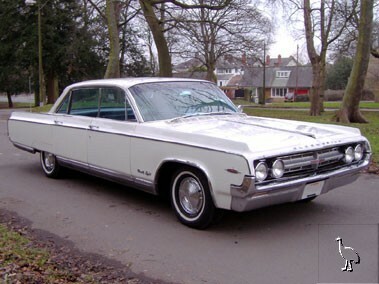 When most classics have either been restored or are in need of rebuilding it is always exciting to find an unmolested one in apparently such wonderful order - surely a real opportunity for one of the many UK-based fans of sixties Americana.